Irish Oatmeal with Cinnamon, Maple Syrup, Peaces, Chia Seeds, and Kefir. Guayusa Tea. Driving out to Portsmouth to pick up my mom from Kenny's house. She needs a ride to retrieve her car from Art Walker's shop off Lynnhaven. It's nice to see her again. She knitted up some buttons that needed replacing on a couple shirts of mine. 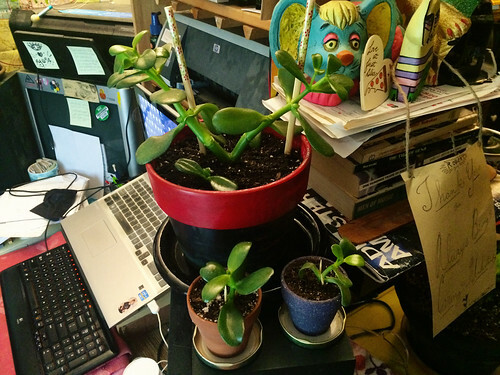 Conducting a surgical operation on my little jade plant. She's been falling over and needs pruning big time. Teaching lessons at Music Makers. Taking a nap in between. Back home. Making dinner for Ana and I: Brown Rice Quinoa Spaghetti with homemade Tomato and Basil Sauce, Onions, Peppers, and a Spinach Arugula Salad. At the music space for DEJA rehearsal. We finally get around to practicing the daunting "Frankenstein" song. It's basically a guitar and keyboard duel. I've gottta do crazy synth riffs and wah effects. I worked on my parts a lot on my own so playing with the band now is a synch. Back home. Enjoying fresh cut Pineapple and a bad action movie. Researching – rock school and lesson prepping.